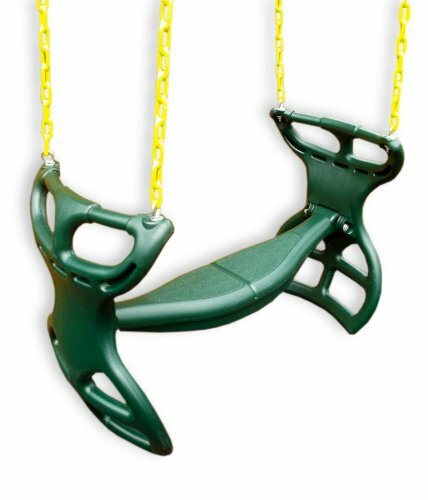 The Eastern Jungle Gym Horse Glider Swing Seat is the perfect accessory for any backyard wooden swing set! Great for families with multiple kids, this swing is designed to fit two children sitting back-to-back and is recommended for children 3 years and older. The swing set is constructed with highly-durable, heavy-duty polymer plastic. Designed for residential use this swing seat can attach to any wooden structure using a four-point mounting brackets (sold separately). This swing seat glider comes fully assembled with four, 66” zinc-coated, 2/0 straight-coil swing chains that are adjustable up to 30”. The bottom 30” of the swing chains are coated in yellow plastisol to allow for a soft, pinch-free grip that is comfortable for even the smallest little fingers!